Maine is the third state which is counted among the highest concentration of jobs and location quotients in this profession. According to the figures provided by the Bureau of Labor Statistics, it can be concluded that 9,480 nursing assistants were employed in the state, in May 2013. The mean annual and hourly salary was $24,610 and $11.83 respectively. As per indeed.com, the average income, in December 2014, was $22,000. The employment per 1000 jobs was 16.29. 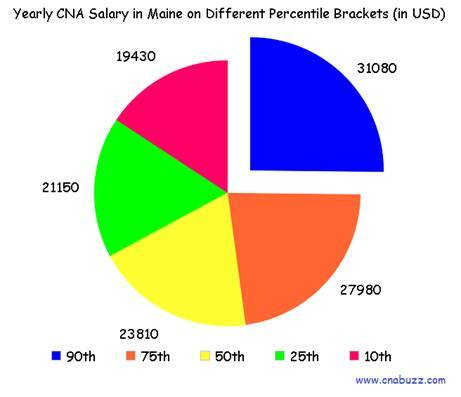 The average CNA salaries for different job postings were 12% lower in Maine as compared to the average income throughout the nation. 90% of certified nurse assistants received less than $31,080; 10% made more than $31,080. 75% of CNAs were offered less than $27,980; the remaining 25% were paid more than $27,980. 50% of the employees earned less than $23,810; the rest of 50% earned more than $23,810. 25% were salaried less than $21,150; 75% were waged more than $21,150. 10% of CNAs were paid less than $19,430; 90% were offered more than $19,430. Several factors encourage nursing assistants to give their best, of them salary is the most important aspect. As per the figures mentioned in the table below, the highest median annual salary of $31,634 is offered by numerous cities, including Biddeford, Portland, Saco, South Portland, Westbrook, and Windham. Augusta is the lowest paying city with median annual salary $27,542. The median weekly salary in the state ranged from $2,295 to $2,636 and the median hourly salary from $13 to $15. The job titles are assigned to the CNA according to their education and experience. These positions are assigned only when they acquire profound knowledge in that respective field. According to indeed.com (December 2014), CNA Hospice earned the highest salary, i.e., $28,000 while Correctional Prison Facility CNA were paid the lowest, i.e., $13,000. CNA Rrmc and Medical Assistant Family Practice earned $26,000. Other personnel received in between $14,000 and $24,000. 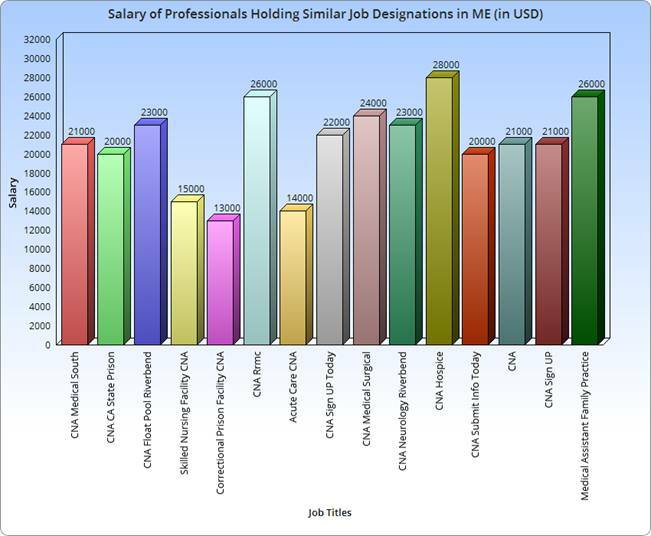 The table below indicates the salary figure of each and every personnel associated with CNA. According to the BLS, the job opportunities for nursing assistants are expected to increase by 21 percent between 2012 and 2022. This occupation has a very limited scope of advancement and is also physically and mentally stressing. Therefore, most of the nurse aides generally leave their jobs to pursue higher formal program. However, if you like challenges and want to contribute for the welfare of society, being CNA is a perfect start for you. Since, the demand for these professionals is high; they can earn a lucrative income in various states of the USA. In nutshell, a bright future can be predicted for the potential nursing assistants. Question 1 – At present, I’m living in Saco, but planning to move to some other city in the Maine. Is there any salary difference within different cities? Answer – The geographic location does play a major role in deciding the salary of a CNA. However, the maximum number of cities provides the same annual salary i.e. $31,634. Auburn, Augusta, Bangor, and Lewiston have a comparatively lower salary package than aforesaid figure. Question 2 – In Maine, what are the highest paying job titles? Answer – In the state of Maine, the job title that offers the highest salary is CNA Hospice. Other job titles include Medical Assistant Family Practice, CNA Rrmc, CNA Medical Surgical, CNA Float Pool Riverbend and CNA Neurology Riverbend.